Google has announced the next major update for Android Wear. Version 2.0 promises a bunch of changes and improvements. It’s the biggest update the platform has seen since it was released two years ago. 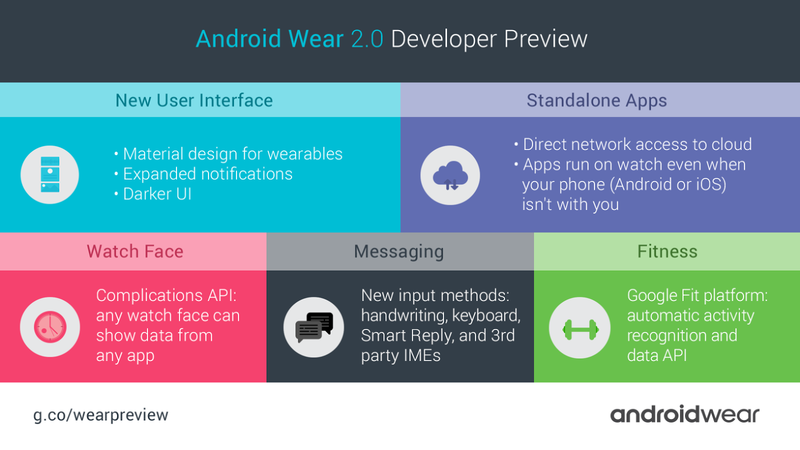 Android Wear is getting a brand new UI that follows more closely to Material Design. Notifications will be expanded, and the entire UI will be darker in color. That should make a lot of people happy. Standalone apps are apps that can run on the watch completely independent from your phone. A new watch face API will allow faces to show data from other apps. Messaging is a big focus in 2.0. Android Wear will finally get a keyboard with handwriting recognition, swipe typing, and standard typing. There was a time when Google would have never made a keyboard for watches, but it seems they have changed their stance on that. Last, but not least, is more Google Fit activity data. The keyboard is a perfect example for all the changes to coming to Android Wear. What started as a platform designed almost entirely for notifications and voice commands has matured into something much more powerful. Android Wear 2.0 is available as a developer preview from here, but the full release won’t happen until this Fall.